Clearly written, accurate and well illustrated, this high quality textbook is an excellent resource to teach yourself the fundamentals of PLCs. This book starts with the basics and is very clear, easily understandable. 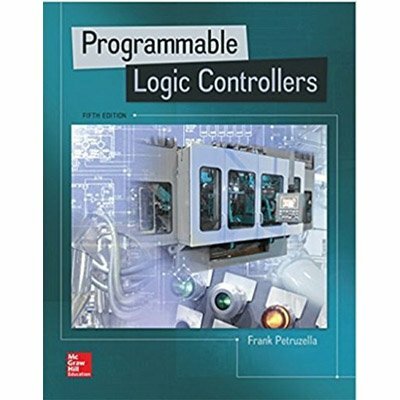 The book continues to provide an up-to-date introduction to all aspects of PLC programming, installation, and maintaining procedures. Improvements have been made to every chapter. The content, applied programming examples, instructor/student resources (including lesson PowerPoint presentations with simulated PLC program videos), test generator, LogixPro lab manual, and activities manual. With this edition, students and instructors also have access to McGraw-Hill Education’s digital products – Connect and SmartBook, for the first time! You can also purchase the LogixPro PLC simulator (Mr. P also wrote a lab exercise manual that comes with the simulator or you can buy the simulator by itself). It gives you the ability to write, test and debug programs using the RS LOGIX instruction set and programming interface–in fact it’s very close to the real deal. You really could have used that when You first start programming PLCs because learning to program using a real PLC hooked up to lights and switches is too limiting (and prohibitively expensive for many of us). And You’d rather not test and debug any of your programs using live machinery if you can avoid it. Clearly written, accurate and well illustrated, this high-quality textbook is an excellent resource to teach yourself the fundamentals of PLCs. Mr. Petruzella has even added photographs and descriptions of the inner workings of commonly used I/O devices, which is especially helpful for novices. Based on Allen Bradley’s SLC500 series and their RS LOGIX programming software, it covers enough ground to enable technicians to understand how they work, how to troubleshoot I/O problems, understand, modify and even originate programs found in typical industrial applications.